Hanging plants are a great way to add life and beauty to any indoor room. They help purify the air we breathe by removing carbon dioxide, adding oxygen and absorbing other toxins such as formaldehyde. Hanging plants frees up floor space and adds visual interest. Hanging plants can also be positioned to take advantage a room’s best light. To begin, choose the location. Most indoor plants require bright, indirect light and a spot that is neither hot, cold nor drafty. Secure a hook or eye bolt to the ceiling. Be sure to set it directly into a beam or stud. 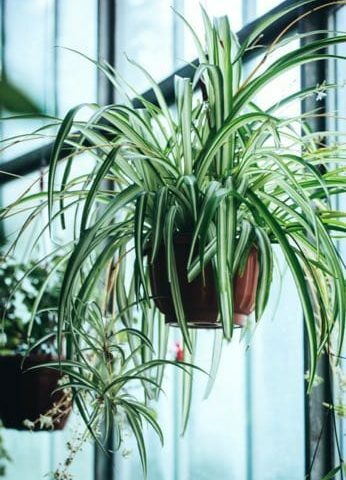 Spider Plant: This is one of the most common houseplants. The spider plant is adaptable, fuss-free and is an excellent choice for beginners. It’s fast-growing and the new plantlets are easy to remove to make new plants. The spider plant is also excellent at filtering the air we breathe. Ivy: Ivy is a fast growing houseplant that has been popular since Victorian times. It is very easy to grow from cuttings. Ivy plants enjoy lots of humidity, so misting often will help keep them at their best. Pothos: Pothos is adaptable to a wide range of indoor environments, making it another great choice for beginners. The heart-shaped leaves can be solid green, but are commonly variegated with white and yellow splashes. It is not too picky about water or humidity, just avoid direct sun. Christmas Cactus: These showy plants are not the sun-loving, spiny desert cactus of the western US, but a mountainous rain forest cactus of Brazil. The bright, tubular blooms are a welcome addition during the darkest time of the year. They enjoy bright light, high humidity and consistent moisture. Boston Fern: Boston fern has gorgeous crinkly fronds that are perfect for a hanging accent. It likes cool room temperatures, high humidity and consistent watering. Hoya: The hoya is a trailing plant with fleshy leaves and clusters of waxy flowers that bloom from May to September. New stems are almost bare and the leaves appear much later. They can be variegated or solid green. Water needs will vary depending on your indoor climate and plant choice. As you bring new plants into your home, check them every few days or so. Feel the soil with your fingers to determine if it’s dry or not. Water carefully with room temperature water and be sure not to let any plant sit in standing water. Bring hanging plants down monthly and shower them in a kitchen sink or bathtub. A monthly shower will remove dust and allow the plants to be thoroughly soaked. Most indoor plants need less water and fertilizer through the winter months and more during the growing months of March- August. For plants that require high humidity, consider grouping these with other plants to create a humid micro climate. Regular misting, pebble trays and room humidifiers will benefit the humid-loving plants. Plant hangers are not necessary but will add a decorative component. Macramé, galvanized metal and woven plant hangers can be found at our garden center.